A while back, FanHQ in the Minneapolis area had a public signing with three Minnesota Wild players, and were able to pull in some pretty good names. Devan Dubnyk, Ryan Suter, and Jonas Brodin were all signing on the same day. I was not able to afford all three, but I was able to afford one. AS a TTMer, I went to Sportscollectors.net to look at TTM stats for the three players to make my decision. Both Suter and Brodin are good TTM signers, and at the time, Dubnyk was relatively new to the team. Since I couldn't make any determination on how easy he would be to get in the future, I pulled the trigger on a Dubnyk. Luckily, the pucks that FanHQ supplies fort heir signings are the Official Game Pucks, and not the autograph pucks. 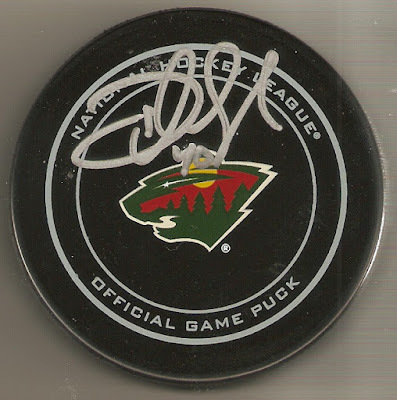 The basic difference is that the official ones are like the one in the photo, and the autograph pucks are mostly black, with a small team logo in the center. They are designed to leave plenty of black space available for the signature, and they do a good job of that, but I still like the Official ones better. To me, it just looks like a higher quality product, which it is. There is a bit of overlapping with the ink on top of the puck design, but I still like this one so much more. Either way, I was thrilled to get this puck of a goaltender who will hopefully continue to be such an important part of Minnesota's success.